Based on a pre-cinema optical device called a praxinoscope, “ActionView” is interactive offering live animation and static object experience. As one approaches, a live animation of a distorted chair winds and unwinds in digital space. When engaged the pieces becomes static and the mechanics of illusion are revealed. As one moves away the animation resumes. The viewer has the option for experiencing the work. Physical materials, body presence, and digital space are linked. Pre-cinematic technology becomes analogous with digital technology as moving images are constructed from pieces of information. MATERIALS. 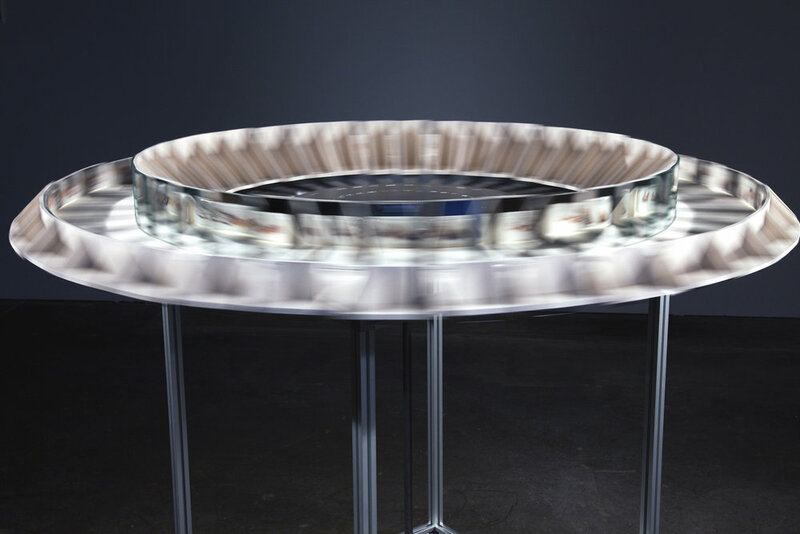 Porcelain, Glass, Digital Glass Decals, Mirror, Aluminum, Electric Motor, Sonic Sensors.